Titan Helicopter Group (THG) is a global provider of safe, efficient helicopter transportation and heavy-lifting services for the oil and gas sector. Our group comprises a number of licensed aircraft operators and accredited maintenance companies, as well as a technical training centre based in South Africa. We are committed to supplying a comprehensive range of solutions and place a great emphasis on delivering exceptional customer service from start to finish. 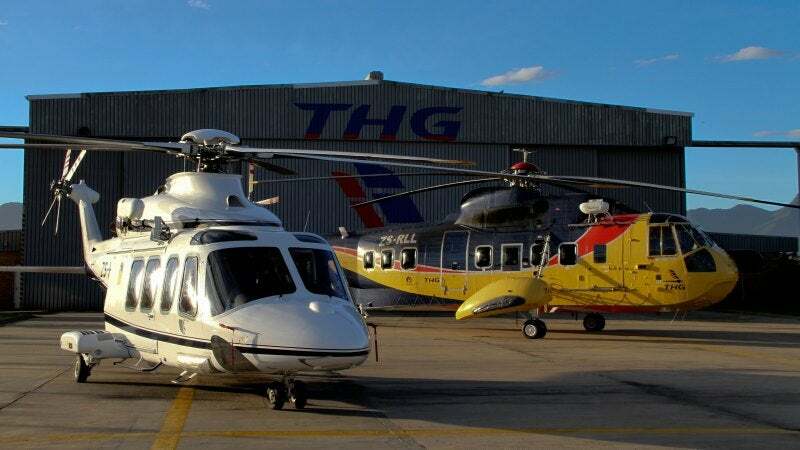 THG’s highly trained personnel have years of combined field experience and are equipped with latest in cutting-edge flight equipment, enabling them to deliver a consistently high-level service dedicated to addressing customers’ operational requirements. Our meticulously maintained fleet contains both Western and Russian aircraft and can be equipped for both day and night instrument flights depending on client needs, ensuring our capability to provide a secure and reliable air transport service. All our helicopters are multi-engine units, and each aircraft has been integrated with emergency flotation capability as an additional safety measure. Each project team consists of members of staff with varied fields of expertise across the disciplines of flying, operation and maintenance, who regularly work together to deliver efficient, bespoke solutions. Titan’s multipurpose roster of vehicles are equipped with a range of airframes, which have each been specifically designed to carry out specialist services. Our versatile helicopter fleet enables us to engage in projects involving extreme and varied terrains both on and offshore, including the ambitious SANAE IV Arctic Station resupply mission, as well as provide assistance for various passenger transport / adventure travel activities. THG’s specialisation in a broad range of areas is exemplified through the company’s ‘wide niche’ strategy, which allows the group to address the specific challenges presented by individual industries. THG is committed to providing customers with an extensive list of efficient air-lifting and haulage operations, encompassing both visual flight rules (VFR) and instrumental flight rules (IFR) activities carrying up to 30 passengers and loads ranging from 100kg to 20t. The company prides itself on its all-inclusive range of offshore support services, which includes ferrying cargo and crew members to ships in transit, as well as crew transfers to exploration vessels and drilling rigs. Our specialist services can serve a diverse number of applications, including logging, firefighting, air crane construction support, and the installation of power line pylons. We are also able to supply critical assistance during salvage / search-and-rescue activities, in addition to delivering emergency medical and flying doctor services using our optimised BO-105 helicopters. THG is a Basic Aviation Risk Standard (BARS) approved operator that has been awarded silver status from the Flight Safety Federation, with safety being a critical consideration in every task the company undertakes. The Titan group maintains an active safety management system (SMS) in order to prevent accidental damages and injury to property and personnel. Our organisation takes a proactive approach to continuously identify and minimise any potential risks that may be associated with a particular procedure or environment. We are diligent in documenting our findings and responses, in addition to providing training for staff on issues surrounding safety management, and are always striving for improvement.